The show is taped in New York City, but Glenn will be joining them via their “Metal Modem” segment! Glenn Hughes will be a guest guitarist (bass) on an upcoming edition of “That Metal Show” – on the USA based cable TV channel, VH-1. On a recent episode of USA cable TV channel, VH-1 Classic‘s, “That Metal Show“, Black Country Communion was unanimously named the No. 1 Rock/Metal band of the last 10 Years. 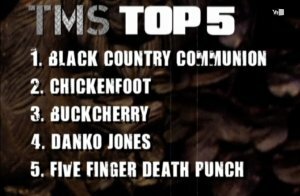 After each of the 3 hosts, Eddie Trunk, Jim Florentine and Don Jamieson; made their own Top 5 list of best rock/metal bands, they compiled a master Top 5 list from the 15 bands. The 3 hosts and the entire audience decided straight away that Black Country Communion was without a doubt, the No. 1 band. Here I am with Eddie Trunk. My appearance on his VH-1 Classic show, “That Metal Show” will first air on April 16th, 2011. Be sure and watch!